Yesterday happened to be the spring equinox, a new moon, a solar eclipse, and a super moon to top it all off. In short, these are all powerful catalysts for renewal and transformation. Its the perfect time for reflection, a time to think about shedding bad habits and forming new positive ones, a time to think about goals and hopes and ambitions, to focus on our priorities and to renew our commitments and promises to ourselves. If you made some new years resolutions or goals, now is the perfect time to revisit them. I’ve felt reinvigorated this week and motivated to make positive changes, because periods of seasonal transition always seem to give me a boost. I finally signed up for a Pilates class, only 3 months behind schedule on one of my new years goals to get more exercise, but I say better late than never. This weekend is dedicated to nurturing my passion in the kitchen, getting in some quality time with hubby and catching up on my studies by devising a realistic study plan I can keep to with my busy schedule and life commitments. How are you embracing this powerful time of transition? These cookies were inspired by an Instagram contest to use Rosemary in a recipe and #spiceupyourweek. I honestly have never been very inspired by or appreciated rosemary fully until now. I’ve always used it on roasted potatoes or root vegetables, but not much else. Yet, its piney, sweet, yet savoury flavour makes it a very versatile herb as I’ve discovered this week. I’ve used it to make a delicious snack size Raspberry Rosemary Smoothie, and these cookies. 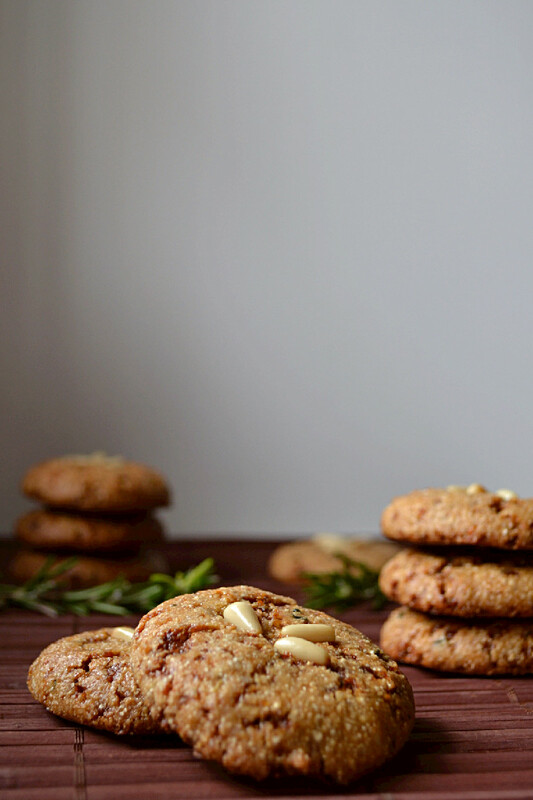 The idea to combine pine nuts and rosemary into a cookie came from the piney aroma of the rosemary sprigs but my research has revealed that I wasn’t the first to think of this. Martha Stewart, of course, as well as several other culinary web sites and blogs have already published cookie recipes with this flavour combination. Most are traditional in their use of flour, sugar, and butter. Some are vegan, but still use flour, sugar and vegan butter and some use olive oil. I set out to create a “flourless” vegan, refined sugar free and gluten free cookie made mostly of whole food ingredients. After a few tasty yet ‘not quite what I wanted’ attempts I nailed the soft, chewy cookie texture I was going after and the sweet, lemony, flavour with a subtle hint of rosemary in the background. I used a combination of home ground sweet rice flour, almonds and pine nuts as the base and infused it all with fresh rosemary and lemon zest. I ended up settling on coconut sugar as the sweetener of choice as it resulted in a better texture compared to brown rice malt syrup or maple syrup, my usual sweeteners of choice. Rosemary is a piney, sweet and savoury herb all at once. It has a decisive aroma and flavour and lends itself well to use in savoury dishes and desserts. Rosemary is an evergreen plant in the mint family and is available year round. It has a powerful aroma and many health benefits and medicinal properties. It is a great source of antioxidants and contains anti inflammatory compounds as well as substances that help enhance memory and concentration, aid digestion, boost the immune system, and promote circulation and stimulate hair growth when applied to the scalp. Coconut sugar is a great sweetener that adds a wonderful caramel like flavour to baked goods and sweets. It’s a great alternative to refined sugar, when liquid sweeteners just won’t do, like when you want to make soft and chewy cookies that spread just the right amount. However, it is still 50% fructose, so moderation is key. These cookies are vegan, gluten free and refined sugar free and made with whole food ingredients like ground sweet brown rice, ground almonds and pine nuts, lightly sweetened with coconut sugar and infused with the flavour and aroma of fresh rosemary and lemon zest. Preheat oven to 180 C and line a cookie sheet or tray with parchment paper. Using a spice or coffee mill, grind the rice, almonds, pine nuts and coconut sugar, one at a time, into a fine flour and add to a large mixing bowl. Finely chop the rosemary with a half mood blade or run it through the spice mill, then add it to the bowl along with the baking soda, sea salt, and fresh lemon zest stirring to combine thoroughly. Add the creamed coconut oil and mix with a fork to incorporate it. Once incorporated and the mixture resembles a coarse meal, add 2-3 tablespoons of water, one tablespoon at a time until a cookie dough is formed. Form cookie dough balls using a measuring tablespoon and place them 1-2 inches apart on the cookie sheet to give them room to spread. 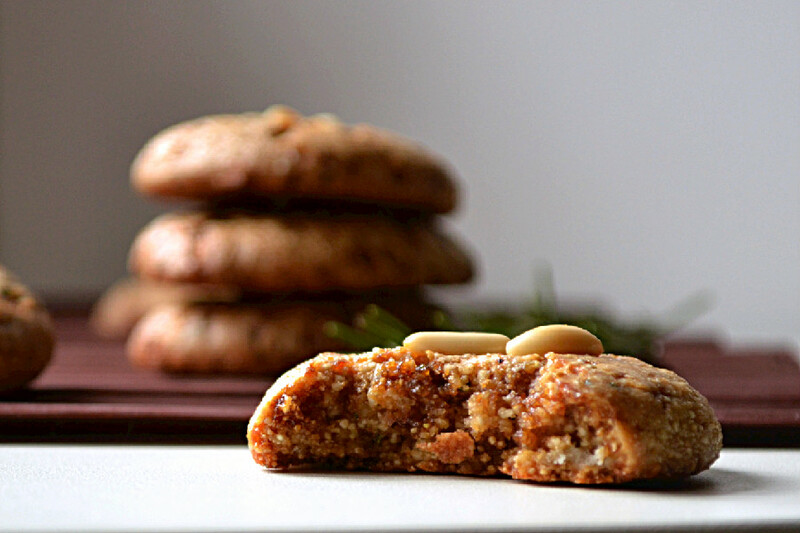 Flatten the tops of the cookies slightly with the back of a spoon or the palm of your hand, and top with pine nuts. Bake on the center rack in a preheated oven for 15 minutes. Remove from the oven and allow them to cool and set before handling them. Transfer them to a plate or cooling rack. Once completely cooled, store in an airtight container at room temperature for up to 3 days. Martha ain’t got nothing on these cookies! 🙂 They look and sound wonderful and I’ll take these any day over the flour and gluten-filled ones. And I think I sort of underestimated rosemary — I mean I like eating it, but never got curious enough to bake a sweet with it. I can sort of imagine the flavor of these cookies though — and I bet it is amazing. Thanks Audrey. I’ve never given rosemary much thought either but it works so well in sweets. These cookies are really one of the best I’ve ever made and the smoothie I posted to Instagram was awesome with rosemary in it too. I’m sure you could come up with some pretty creative uses for rosemary. You’re the queen of creativity. Wow these are sensational, love the rosemary+lemon pairing, very Italian. Good job!!! Thanks Dawn. They’re really great if I do say so myself. Hope you can give them a try. Thanks so much Dawn. Hope you can give them a try and let us know what you think. They were fab, it’s going into the cookie repertoire. Going to try the tahini orange blossom cookies next. Thanks for sharing! So glad you enjoyed them Dawn. 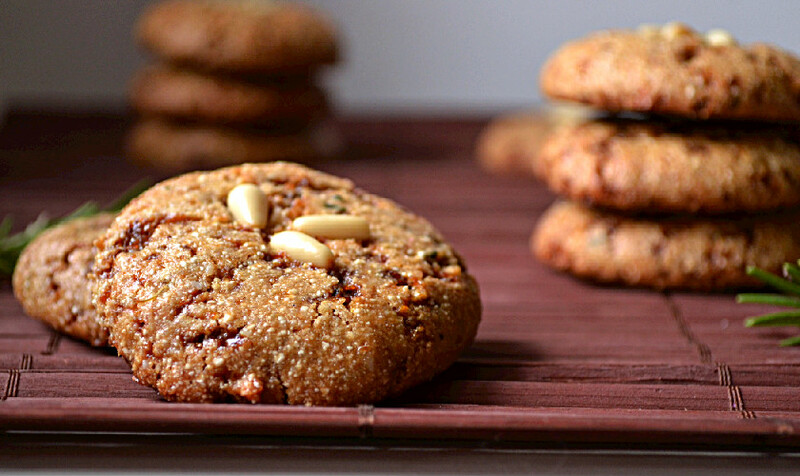 Let me know what you think of the Orange Blossom Tahini cookies…it’s one of my favourite flavour combos ever.